A few years ago, in Avril 2005, I had the privileged (quite a few years in a row) to spend a few days in Spain's most recognized wine regions, but this year more particularly Priorat (also known as Priorato) to visit some of the most exclusive wineries and talented winemakers of Catalonia. My old boss, Justin (a Spanish wine aficionado) and myself, a wine buyer and wine lover working for a retail store specialized in Spanish wine, were welcome pretty much everywhere with warm welcomes and able to enjoy some private tastings with the winemakers on older and current vintages but also tasting wine at the barrel to evaluate the next vintage, which happened to be the extraordinary 2004 (this year we also went to Rioja and Ribera del Duero to also taste at the Barrel...What a trip and what a promising vintage!). Our journey thought out the mountainous and rocky steep terraced slopes of Priorat, a little enclave in the mountains located about 130 kilometers south-west of Barcelona, brought us to some of the most well known wineries like: Clos Mogador, Alvaro Palacios, Mas Doix, Vall Llach, Mas d'en Gil, and of course the unmissable Mas Martinet. Mas Martinet was established by Josep Lluis Pérez, one of the prominent figures of Priorat and more especially, the leading winemaker of one of the five pioneer families who re-discovered the area and its potential in the late 1980s and rapidly elevated the fame of this region by producing world-class wines from very old vines. Mas Martinet is now even more famous since Sarah Pérez, Josep Lluís daughter, took over the property and handled the vinification and winemaking. She produces gorgeous wines that are generous, full, robust yet elegant, racy and almost feminine in a very balance way with lot of layers and nuances; definitely charming, lingering and age worthy Priorat. A "must" try. 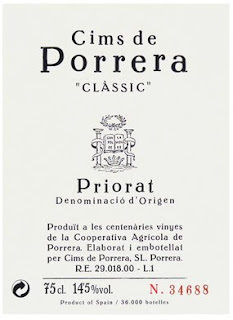 Priorat has evolved over the past 20 years. It is now much more open to the public and experienced a renaissance with hotels, Bed & Breakfast, gites and restaurants mushrooming slowly without impairing the rustic and jolliness aspect of the region and its incredible landscape. We had dinner at Sarah's restaurant, the "Irreductibles" (like in Asterix & Obelix the famous French comic book series created by Goscinny and Uderzo), a delectable fusion restaurant opened in 2004, mixing traditional Spanish and Catalan specialties with a flair of Asian culture and other influences from other countries. During the Dinner, Josep Lluís Pérez, an oenology professor and an unconditional searcher, spent a great deal of time explaining his last research about Hydrometry and new irrigation systems in the vineyards. Sarah Pérez couldn't stay and left just after the aperitif but it was a pleasure to have her with us for a little while. The one who put a smile on our faces for the entire dinner was the jovial Adría Pérez, the son of Josep Lluís and brother of Sarah. He made a big impression when he arrived in his custom made "bolide", a flashing car mixing retro and new features in a stylish way. Unmissable, especially on the small curvy road of Priorat, you know who he is right away. Adría topping one of his barrels inside one the old concrete tanks at Cims de Porrera. the Pérez family began managing the local cooperative in Porrera. However, in 1996, Josep Lluís Pérez told the members of this former cooperative that he would buy their entire production at a good price; in exchange he would improve viticultural and vinification practices. Winemaking seems to be a family's talent going from generation to the next, because Adría is doing a great job. It is quite fascinating to realize that instead of using the old concrete tanks that were available to vinify and age the wine, they have been opened and they are now filled with oak barrels...Yes, you understood well, at least it was like this when I last visited it, the concrete tanks next to each other that used to welcome wines are now open and form somewhat like a long corridor passing through small rooms where now resides multiple oak barrels (in each room) where Adría crafts with passion two wines: Cims de Porrera "Classic" and Solanes, the 2nd wine. Last produced in 2001, Adría Pérez only produces Cims de Porrera Classic only in the finest years. The wine is made from the oldest Carineña (Carignan) vines, producing very low yield, planted on steep rocky slopes at 400-600 meters of altitude (hence the name "Cims" which means Summits in Spanish) surrounding the village of Porrera, south Catalonia (Spain). A blend of 90% Carineña (Carignan) and 10% Garnacha (Grenache), the 2004 Cims de Porrera Classic is a long-awaited reward for those who truly appreciate exceptional Priorat wines. Already attractive in the glass this wine has a deep, intense ruby hue. The nose exposes aromas of back berry, Cassis, dark cherry and oak notes mixed with intense stony minerality, liquorice, almost leather, spice and roasted coffee hints. The concentrated and expanding palate follows with the same type of flavors, adding in complexity by the seconds. The finish is juicy, full of fruit and soft, chewy and present and young yet integrated tannins. A delightful and substantial wine to enjoy with grilled steak, a rack of lamb or a roasted suckling pig (like in the banquet of Asterix's village at the end of each book!). Although I didn't talk so much about Sarah's wines, they are a "must" try too. Cims de Porrera and Mas Martinet are my two favorite Priorat wines, with Vall Llach and Clos Mogador. More recently I also came across a small, well crafted and affordable Priorat wine called "La Nita" (the 2005 and 2006 vintage were really good). Step into the Green! Drink more Biodynamic and Organic wines (and food) from sustainable culture and respect the environment! Cantine Colosi is a winery located in the village of Giammoro located west of Messina, on the North eastern shore of Sicily. However, their farm also covers seven hectares in Salina (a small island in the Eolian Archipelago), five of which are already planted with vines, located at Gramignazzi in the Borough of Malfa. This area is recognized as one of the best in the island both for its exposure and for the physical-chemical nature of the volcanic soil which is particularly suitable for vine cultivation. The establishment of the vineyard, made exceedingly difficult by the morphology of the soil was carried out in terraces by restoring the old dry-stone walls; ‘Guyot’ pruning is carried out by leaving only a few buds to yield because during the hottest months, due to the impossibility of watering, plants undergo really hard times. Piero Colosi, the winemaker, has perfected the art of producing wines with the local indigenous grape varieties and he has been well known for 2 wines in particular: Rosso made with Nero d’Avola and Primitivo, and Bianco made with Inzolia and Catarratto. For more meditative versions the estate is vested in Zibibbo, the Moscato clone from Pantelleria that has a sweeter, nuttier richness and makes excellent dessert wines. The Malvasia comes from the Salina Island and is an ambrosial delight of floral and mineral aromas with a great freshness. 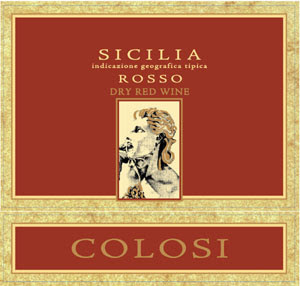 Made from 100% Nero d’Avola, Colosi Tinto 2007 is a great, rich and generous everyday wine from Sicily. It has a ruby color with an expressive nose, quite intense with complex aromas of plum and dark cherries. Dry, medium bodied and well balanced, the palate is fairly dense and earthy with ripe fruit flavors mixed with hints of spice. The overall profile of the wine is pleasant, friendly and versatile. Pair it with simple pasta dish, beef, roasted or grilled red meats and cheese. Step into the Green! Drink more Biodynamic and Organic wines (and Food) from sustainable cultures and respect the environment. 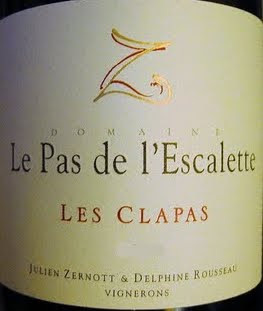 Le Pas de l’Escalette is a young Domaine owned by Julien Zernotte & Delphine Rousseau. It is located near Poujols, a little village situated northwest of Montpellier and south of the National Park of the Cévennes (Hérault). In 2002, while searching for some new Terroir(s) to establish a vineyard, Julien and Delphine passed by Pégairolles-de-L’Escalette, a little “Hameau” (hamlet) nestled in the gentle rolling hills of the “Pas de L’Escalette”, on the emblematic path between the south of the Larzac plateau and the Mediterranean sea. They fall in love with the area and its magical feel, and despite the stony, hot and arid land, they took the challenge of creating a Domaine. 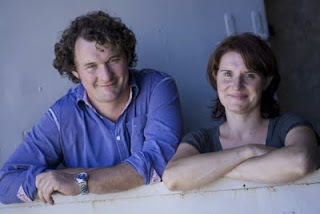 Julien, with his degrees in viticulture and oenology (as well as a track record of producing outstanding wines in the Loire appellation of Menetou-Salon), and his wife Delphine, have built the domaine from small parcels of old-vine Grenache, Carignan, Syrah, and old plantings of Alicante, Aramon, Carignan Blanc, and Terret Bourret. Their Domaine is growing. They recently bought some vines in the "Vallée de Lauroux" (somewhere west between Pégairolles et Poujols, not too far from the Domaine), planted with 15 years old Grenache Noir, some old Cinsault, two parcels of Syrah, some olive trees and a nice "Mazet" (name for a small country house). Surrounded by small dry limestone-calcareous stone walls called “Clapas”, the 10 hectares of vineyards are planted in terraces carved into the rocky soil of steep limestone hillsides, located at 350 meters above sea level in the southern foothills of the Larzac plateau. 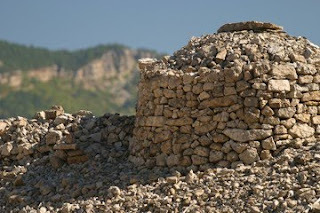 On the calcareous stone heaps of the plateau, they work the soils in the most natural way possible, with Organic leaning towards Biodynamic methods and immense respect for the environment, and more especially for the diverse indigenous wild herbs, flowers and garrigues. If we divided their entire vineyard in two, half of the parcels are east facing so enjoy the rising sun, the rest face west benefiting from the setting sun. Complementing the ideal exposure of the vines, the stony soils provide complexity and depth, but also contribute to the richly ripe fruit by redistributing the heat of the day during the night, and help to restrain yields, resulting in wonderful concentration of flavors. The grapes are hand harvested and transported to the winery in small plastic baskets to be more easily hand sorted and destemmed. Fermentation take place in tronconic shaped oak vat (in a truncated cone shape). The wines are then aged partly in oak barrels and partly in bigger oak vats. Unless the vintage requires it, Malolactic fermentation isn't always done to keep the maximum of freshness. They are just about to finish their new cellar where the 2009 vintage will be the first vintage to be vinified and aged. Their philosophy: The exposure of the vineyards on terraces, the altitude, the depth of the clay-calcareous soil, the traditional grape varieties used and the temperate climate, represent the perfect factors and conditions to produce great wines. “Le Grand Pas” is their main wine and the primary reason for this adventure. It is a beautiful, rich and age worthy red wine blending harmoniously the silkiness and richness of the Grenache with the freshness of the Carignan and the finesse of the Syrah. “Ze Rozé” is self explanatory: made from old Syrah and Cinsault, it is a fresh and simple rosé for everyday drinking under the shadow of a fig tree or an oak tree during a picnic, as an aperitif or even with a light summer meal with salad, fish, chicken and cheese. “Les Clapas” Blanc, an unusual blend of two forgotten grape varieties: Carignan Blanc & Terret Bourret (one of Languedoc’s oldest grape varieties, also known as Terrain and Terret Gris), delivering great freshness and complexity due to the age of the vines and their location. Goat cheese is a “must have” with it. “Le Premier Pas” is a “blink of an eye” to the first step of their son, Jules. It is an easy going, friendly and versatile red to drink for any occasion. It is a blend of all the grape varieties from the Domaine, and its vitality makes it the perfect everyday wine. In short for the vinification process: the hand harvested grapes were totally de-stemmed and de-stalked. Then macerated in vats for 30 days. The alcoholic fermentation occured in 50 hl oak casks with natural yeasts. Regular draining and circulation of lees. Malolactic fermentation occurred in wood and the wine was then aged for ten months half in oak vats and half in oak conical casks. The old Carignan vines (in Gobelet training system: meaning roughly untouched and unpruned, it looks like a a small round vine bush just a few inches of the ground cover with small stones) are the soul of this wine, they bring the earthiness and the freshness. The opulence and richness come from the Grenache. The old Cinsault and the Syrah respectively bring the aromas of flowers and wild red and dark berry fruit. Overall, the Meridional profile of this wine accentuates the characteristics of these Languedoc grape varieties. A blend of 35% Grenache, 35% Carignan, 20% Syrah and 10% Cinsault, the resulting wine is quite amazingly attractive: balanced, focus, earthy, medium bodied yet complex, dense without being heavy and well structured by present yet integrated tannins. The robe is dark ruby red yet of medium intensity. The nose is quite expressive, clean and floral with bright red and dark berry aromas intermingled with earth, mineral and spice. The palate follows the same path with the same type of flavors in a complex, expanding, bright, vibrant and focus way, leading toward the lingering finish. Still a bit young with great ageing potential, we didn't decant it but opened it at least 30-45 minutes before drinking it. What a lovely wine! As I always say when I buy a wine: “A good wine always calls for another glass!”, well this wine has my approbation to be on the shelf of the store. No problem. I instantly loved it when I first tried it. Last Sunday, I brought it for the Lunch at a friend’s place and it showed beautifully. We enjoyed it with “Carré d’Agneau à la Provençale et Purée de Pomme de Terre a l’Ancienne” (baked Rack of Lamb with onion, shallots and herbs in olive oil and served with traditional buttered mashed potatoes). It was a great combination of flavors. Pictures taken from and Info mostly translated from the winery website at www.pasdelescalette.com , where you will also find great pictures of Pas de L’Escalette hills, vineyards and surroundings. We only have 1 bottle in stock of the 1991 Domaine Billard-Gonnet Pommard 1er cru “Les Bertins” at $49.99 and I’m hesitating between trying to sell it or just open it to taste it. Established in 1766, the Domaine Billard-Gonnet has been passed down through the generations from father to son. Over the last centuries, the domaine slowly acquired portions of vineyards. 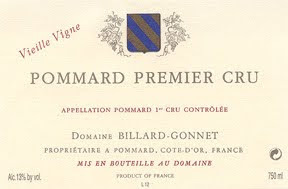 Thus, in addition to the Pommard village appellation wine that they produce, Domaine Billard-Gonnet also crafts wines from patch of vines planted respectively in 8 of the 28 most recognized "climats" (name locally attributed to a delimited area like a parcel or a vineyard) classified as Premier Crus of Pommard (listed below). Pommard 1er Cru "Les Bertins"
Pommard 1er Cru "Les Poutures"
Pommard 1er Cru "Les Champonnieres"
Pommard 1er Cru "Les Pezerolles"
Pommard 1er Cru "Les Jarollieres"
Unfortunately, nothing in 1er Cru "Les Epenots" which is also one of the best "climats" of Pommard and consequently happen to be one of my favorite. Although, the main grape variety used for the wine production in Pommard is evidently Pinot Noir 9like in the rest of Burgundy for all red wines), Pinot Gris (also called Pinot Beurot) and Pinot Liébault are also used in tiny quantity in the non 1er Cru and generic wines. The AOC Pommard only produces red wines, no whites at all. The quality of the soil in the diverse vineyards and the age of the vines only allow for very low yielding and limited production yet insure concentration, complexity and depth. Vinification and ageing process are done in the most traditional way. The grapes are carefully hand selected and fermented in temperature controlled open oak vats. Once the fermentation is done, the wine is put into small oak barrels for 18 months (or longer if necessary). Although, I didn’t try it, I can’t imagine this wine to be alive anymore. Surely it will be an interesting experience to open it and demonstrate if this wine has survive (for so long), especially when 1991 vintage wasn't as good as some of the previous vintage. 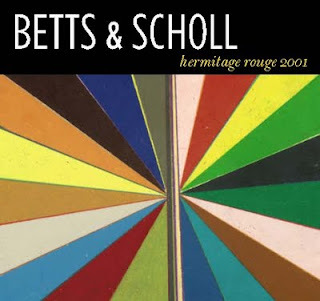 On release, the 1991s red Burgundy possessed fine fruit, medium-bodied profile, bright acidity, firm tannins, and a slight "resinous" streak through the middle that made them fairly unenjoyable to pull corks on over their first couple of years of life. Their austere and somewhat rustic attitude evolved after about 3-4 years in the bottle. Although they never reached the richness and length of the 1990 vintage, once the tannins were a bit more integrated, the fruit came back to life and the same unfriendly 91s were suddenly opening up and drinking beautifully about a decade after bottling, with the secondary and tertiary aromas of maturing Burgundy beginning to emanate from the glass. 1991 red Burgundy wines were considerated as “sleepers” coming right after the 1990 vintage, but I'm not so sure if this particular wine from Billard-Gonnet was one of them or not. It has been kept in the temperature controlled room at “Heights Chateau” for at least the last 5 years or more. Collectors and amateurs may find an interest to buy it and try it; or if we can sell it, we may end up open it and drink amongst us at the store. I’m open to any comments on this particular wine, if you could help me find out how does it taste. This wine is produced in limited quantities from a single vineyard of 4 acre called “Corda della Briccolina” planted in the village of Serralunga d’Alba, Piedmont. 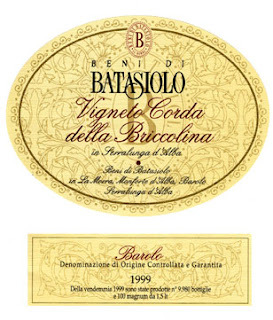 It was aged in small French oak barrels, making it the only Barolo Cru of Batasiolo aged in French oak. The steep south-facing terrain and a soil rich in limestone and calcium carbonate makes this area highly suited for producing well-structured, full-bodied and decidedly long lasting wines with intense color and persistence. 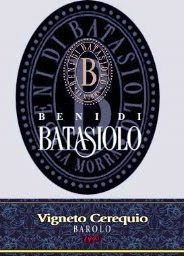 Although Batasiolo is, in my opinion, a slightly more modern style than some of the cult traditionalist out there, the resulting wine is quite exceptional with generous fruit. Moreover, the fantastic 2001 vintage makes it even more complex. Made from 100% Nebbiolo in its subvarieties (clones like Michet and Lampia), the Corda Briccolina 2001 Barolo has an intense garnet red color of medium to good intensity. The nose exposes notes of ripe dark fruit, spice, cinnamon and earth intermingled with oak hints. The palate is rich, dense and well balanced yet young with dry tannins that needs a bit of time. The finish is lingering quite nicely with persistent fruit flavors, touch of oak and spice notes. Quite lovely. A keeper. This excellent 2001 Barolo comes from a single-vineyard called “Cerequio” planted in La Morra, a little village next to Barolo, with an excellent ageing capacity. It is considered one of the most historical vineyards for the production of Barolo wine, which has also being called “The Petrus” of Piedmont. The wine was aged for 2 years in big Slovenian oak barrels and remained for a further 8-10 months in the bottle before release as a refinement period. The resulting wine is superb, with an intense red garnet color. The nose exposes ethereal, rose petal and spice aromas with hints of tobacco, mint and chocolate. The palate is balanced, rich and elegant with rich plum flavors and a long silky finish. Pair it with roasted meat and aged cheeses. Step into the Green! Drink more Biodynamic and Organic wine (and food) from sustainable cultures and respect the environment! Founded in 1980 by Don Florentino Arzuaga when he acquired a piece of land in the heart of Ribera del Duero in a town called Quintanilla de Onesimo. The property is now known as “Finca La Planta”. It has a farm with deers and other wild animals. And the gargantuan building encompasses an hotel, a spa and the winery itself surrounded by vineyards. From 1982 to 1985 the first vines were planted, and in 1993 the first bottlings were marketed internationally under the Arzuaga label. In 1995, winemaker Juan Carlos Martínez tookover at Arzuaga after woking closely with winemaking legend Mariano García. Arzuaga produces five wines from 150 hectares of their own vineyards, consisting primarily of the varietals Tempranillo (Tinto Fino), Cabernet Sauvignon, and Merlot. Owned by the Arzuaga Navarro, Azienda Arzuagua is a traditionalist, Terroir oriented and organically farmed winery neighboring Vega Sicilia and producing earthy, intense and aged worthy Ribera del Duero. Ignacio Arzuaga, the current director, is a great guy that met many times in New York and a few times at the winery. His wines are like him: big, earthy and generous with nuances and depth and a good sense of humor. The wines are made by a skilled and passionate young winemaker named Pascal Oscar Navarro. The 2004 Reserva is surely one of their most accomplished wines of this decade. The resulting wine is deep dark red in color, smooth and complex on the nose offering both dark and red cherry aromas as well as a woodiness. It is rich on the palate with present yet integrated tannins and still retains its fresh pure fruit characteristics complementing its rich, dense and earthy palate. Still very young and promising, keep it for a little while or decant to better appreciate it. Fall evokes the changing colors and multiple shades of the leaves in the forest; the mushrooms and truffles hunts; the warmer cloths and the scent of burning logs in the fireplace; lazy Sundays under the blanket reading a book or watching a classic, while the stew is cooking. All of these comfort our hearts and prepare us for the up-and-coming winter season. Fall also calls for earthier food and wines with fuller mouth-feel, richer fruit and more Terroir-oriented savors. Made with atypical and indigenous red grapes from three wine regions aside of the beaten path, the following wines encompass all of the above cited fall’s feelings, sensations and flavors in a bottle. Kanonkop is one of the well known wineries of Stellenbosch. Their Bordeaux-like style, blend and structure greatly appeal to most customers and usually please the connoisseurs. The adepts of South African red wines often compare their wines to some of the best Bordeaux yet at a more attractive price. Kadette is Kanonkop’s second label, yet like the first label it presents very enjoyable fruit, a generous palate and a lovely balance. A blend of approximately 50% Pinotage, South Africa’s pride, blended with Cabernet Sauvignon, Merlot and Cabernet Franc, this wine was matured in Bordeaux size (225 liters - French Nevers forest) barrels for up to 16 months. The resulting wine offers rich, structured and juicy ripe red and dark berry flavors with hints of oak, spices and earth. The lingering finish presents some dry yet very integrated tannins. Pair it with a grilled steak or even venison and game. 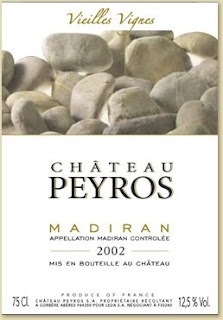 Chateau Peyros is the southernmost property of the Madiran Appellation. It takes its name from a local Gascony word which means "rocky location" or "stony place". Its location combines exceptional Terroir and ideal growing conditions. The main objective of Chateau Peyros is to apply the most natural and adapted wine making methods to their vineyard and cellar to protect the earth and its Biodiversity and to maximize the quality of their wines. Most of their wines are not filtered to avoid imparting taste and flavors, therefore any natural deposits and slight sedimentation in the bottle are a guarantee of the wine's authenticity and truthful, unique expression. A light decantation is suggested to fully appreciate this Tannat based wine. Typical of the infamously hot 2003 vintage, the full bodied and opulent Chateau Peyros is a blend of 60% Tannat, Madiran’s indigenous grape (which slowly became the national grape of Uruguay), and 40% Cabernet Franc, both from 40-plus year-old vines. Deep purple in the glass, the initial aromas of dark plum, blackberry and cedar unfold to reveal layers of peppermint and coffee. Fully ripe dark fruit and black berry flavors coat the palate along with notes of bitter chocolate and spices, sustained by a generous acidity and firm yet fairly integrated tannins into a long, structured finish. An earthy, slightly rustic red to be enjoyed with hearty fare: think roast beef, lamb and game. Although more recognized than Madiran, Cahors remains one of the lesser known small wine regions of the southwest of France (that people do not venture easily to taste). However, Cahors produces great Malbec based wines that were the initial inspiration for what is now the fame and pride of Argentina. Big, concentrated, tannic and earthy, they usually need time and decant to fully deliver their character and personality. 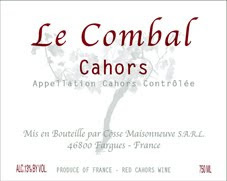 The 2004 Le Combal is very dark and deep purple color. The Bordeaux-like nose is clean, dry, earthy and smoky. The palate is rich, with enjoyable dark wild berry flavors, minerality and forest floor notes intermingled with hints of roasted coffee, mushroom and spice. Firmly textured yet with a great juicy mouth- feel, this wine has a finish that is slightly tannic and a touch rustic, yet it tastes really good. Beside, a piece of semi-hard flavorful cheese or a slice of roasted meat should ease some of the slight angularities. Like the Madiran, this Cahors is an earthy, peasant’s like, wintry drink after a hard a day braving the unfriendly weather and the other complications of the day. 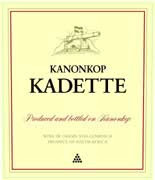 Overall, The Kanonkop Kadette is a friendly, versatile wine to enjoy with or without food. However, both the Madiran and the cahors will warm you up nicely when paired with southwest of France specialties like a "Cassoulet de Castelnaudary" or "Saucisses Lentilles de Toulouse" or "Magret de Canard" from the Landes.